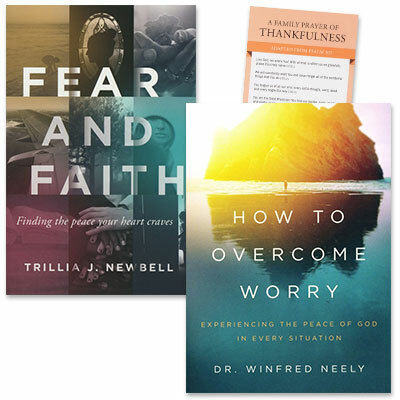 Purchase How to Overcome Worry and Fear & Faith and receive FamilyLife's Family Prayers of Thankfulness free. We will never be short on fears.... Failure, rejection, sickness, losing a loved one, being alone—the fears we carry are many and heavy. Fear can be a tyrant, a bully we can’t hide from. It can paralyze our spirit, damage our relationships, and hinder our faith. Lift and lead your family in godward gratitude with "A Family Prayer of Thankfulness!" This prayer, adapted from Psalm 103, will help you express and expand thankfulness at Thanksgiving and year-round. On the back you’ll find suggestions for guiding your family in specific thanks.